Lots of new things going on now. Maybe that's just a consequence of 25 generations having elapsed since I last listened carefully to the channel. We're at 90k ratings - not far to 100k! Here's the first medley from the new population. There are hardly any percussion sounds at the moment (I just included one of just a few in the population at the end to prove they exist), but it's sounding very fine. We forked the original population at 530 generations and reconfigured it to use pre-recorded drum sounds. Here's the link to the new channel. 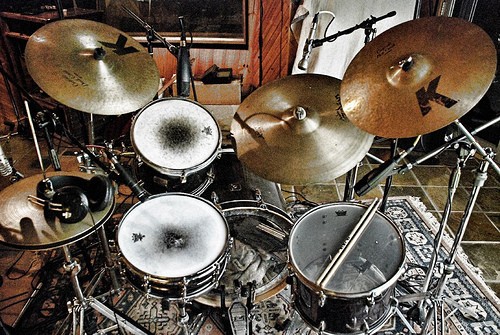 The drum sounds will take a while to appear because the incorporation of new elements relies on mutation. We have also switched on "homologous recombination" (the implementation is not 100% faithful to nature, but it has the same effect) and upped the recombination rate to compensate for the fact that crossovers will now be less destructive. In English: during the mixing of parental genetic material, basslines will be swapped with basslines, and melodies will be swapped with melodies, allowing more specialisation of the sounds and melodies. But don't worry, we'll keep the music evolving until next year and we'll even add new populations to the site. We just had to draw a line somewhere so we can get on with the analysis.